At least 50 workers from GARVIHA Co, Ltd in Hai Duong were taken to Hai Duong General Hospital to undergo emergency treatment after exhibiting signs of food poisoning such as nausea and dizziness on April 10. In addition, the Military Hospital 7 in Hai Duong province also admitted 21 more workers, including two pregnant workers, from the same company at 6pm after they showed signs of suffering from the same symptoms. After being notified about the incident, the Hai Duong Branch of Food Safety and Hygiene dispatched health workers to the Military Hospital 7 in order to clarify the cause the incident. The city’s police force has also been working alongside the Hai Duong General Hospital to investigate further into the incident. 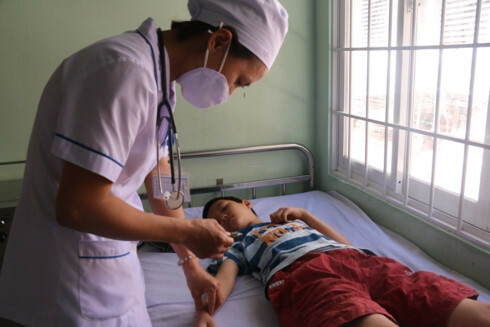 Hoang Thi Hue, a worker who was hospitalised, said she ate fish, roasted peanuts, fried gourd, and boiled cabbage for lunch and began to suffer from a headache and nausea not long after at 2:30 pm. The symptoms were so bad that she and many of her co-workers had to be taken to hospital to undergo emergency treatment. A further investigation into the incident is still underway.